I bought this bed and the matching chest and night stand. All the pieces are very well made, and look as if they will last long. You need to assemble everything, but instructions are included and are easy to follow. I'm very happy with our purchase, and recommend this product. 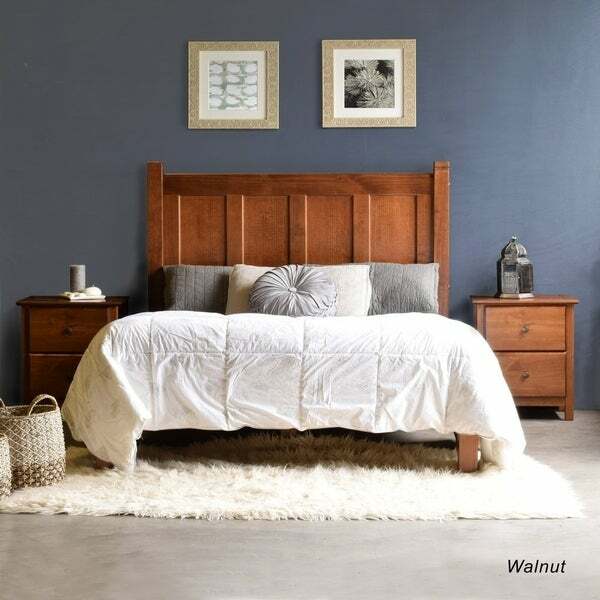 Add simplicity and timeless style to any bedroom with this Shaker-style platform bed. Made of solid pine wood, this bed is designed to withstand years of use. A center rail with three support legs gives extra strength and stability, and the dark pine finish adds beauty to any traditional decor. The platform design means no box spring is required. I bought two of these beds, to create a guest room, and am very pleased with the way they look. Both headboard posts (one in each of the beds) had small nicks, nothing disastrous, and it's not distracting from the look. It took me about 2 hours to assemble the first bed (by myself), and about 90 minutes to assemble the second. Unless your mattress is at least 8 inches high, there will be a gap between the mattress and the bottom of the headboard. Also, one of the bed's slat 'ladder' had a couple of slats that were slightly bowed, but the weight of the mattress prevented any problems with noise. When assembling, the box with the long pieces is the exact right height to support the sides when assembling the headboard and foot board to the side boards. This bed is better than expected. It is solid wood and extremely sturdy. It did take my husband over an hour to put it together - and he's pretty handy. But, that wouldn't deter me from purchasing this again! Looks great in my teen son's room. Product was well packaged and arrived in perfect condition. Simple directions were easy to follow. I was able to assemble on my own with no assistance. I ordered the cherry finish and it was definitely brown-toned with no hint of red. The bed looks lovely in my guest room and would work with any decor. Very pleased with this purchase. Grain wood furniture is now one of my favorites. This bed is made of real wood with no MDF. It also comes with very high quality fasteners and is very easy to assemble. I definitely recommend this bed to anyone who is looking for a nice, sturdy, high quality bed. I bought this over a year ago and it's just prefect in my little boys bedroom. It is sturdy and looks so stylish. I bought this because I love the look of PB Kids but didn't want to pay their prices. The frame will support just a mattress with no box spring. It is the perfect height for my then 3, and now 4 year old to safely get in and out of. I have had it for awhile and never had any problems with a chemical smell as others have stated. You will love this bed if you get it. We purchased this bed over a year ago. It is very nice. Finish is great and the platform works well with just a mattress, so no box spring needed. We are using it in our spare bedroom and have several comments on it. Love the solid wood. Cherry stained was a tad darker than I was expecting, but it still fit in nicely with the rest of my furniture. It does smell pretty strongly in the beginning, so I highly recommend letting the pieces air out first before assembling to sleep on. So far so good, feels very stable and secure. One thing to note is that if you're not using a box spring, there may be a small gap from the headboard to your mattress. My current pillows sometimes slide into that gap, but it's not a deal breaker for me. I like that it's not as low as some of the other platform beds, and I could put things underneath my bed if I later decide I want to. This is a very nice all wood bed. It was simple to put together and it has plenty of wood slats to support a mattress without a box springs. I bought this piece for my 14-year old. I also purchased the matching solid wood chest to compliment it. This was my first online furniture purchase, and I was a bit nervous. After receiving the piece, I was quite satisfied. Putting it together was easy, and it's quality was well over what I expected. I am really glad that I made this purchase. And like the matching chest, I'm certain that my son will be able to take the bed with him when he graduates high school and goes off to college. This bed reeks of pure chemicals out of the package, two weeks after being assembled all of the clothing and furniture in my room reeks of varnish and the smell made my whole family sick with headaches and sore throat for two weeks. The shipping weight/size make returning this near impossible after assembly/disassembly, complete waste of money, can't even be kept as a mediocre purchase unless I want live with a sore throat and clothes/bedding that smell like varnish. I LOVE this bed!! It is so much richer than it should be for the price. I bought this for my Airbnb but intend to purchase one for my own home. It’s very sturdy and expensive looking. Highly recommend!! This is a beautiful headboard that looks very high quality. The color is perfect! Very nice looking and sturdy. Well made. First time ordering furniture on over stock, bed arrived very fast. 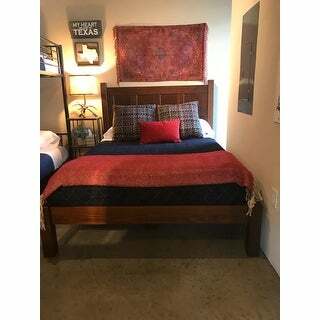 The bed was nicer than in the picture, we received the darker espresso wood, it’s more like a deep gray drift wood color. The bed was solid wood very sturdy, very easy to put together. This was purchased for my nephew whom is 10 and he absolutely loves it! Great buy highly recommend! I ordered this bed for my son and was pleasantly surprised with the quality of the furniture. It was extremely easy to assemble, I put it together by myself in about an hour. The bed is beautiful and seems to be very sturdy. I would definitely recommend this item! I love the look and quality. Not crazy about the fumes from the finish. Hoping that goes away soon. Bought for my son for Christmas. Easy to assemble and nice looking bed. Really like the look of the wood. So many of the beds seemed to be geared towards female customers. Bought the platform for underneath for additional support. Could not be happier. Quality product perfect for our sons room. Well packaged nothing was damaged when delivered. Would even by again for myself for my room. The wood grain show even on the dark espresso finish. Don’t need a box spring as it makes it too tall in ratio to headboard height. Solid material. Clean finish. Easy assembly. I would recommend. "Is the full size bed better suited for a standard Full mattress (74in in length) or Full XL (80in in length)?" It will only fit standard full mattress. "can you use a memory foam mattress?" Yes, you can use a memory foam mattress. "Instructions didn't come with our delivery. Where can I find them? Thanks!" "What is the height from the floor to the bottom rail? I have some storage draws on wheels that I am hoping will slide under the bed. Thanks!" From the floor to bottom rail is 9.5 inches. "What is the height of the headboard?" From the floor to the bottom part of the head board is 22&1/2" and from the floor to the top part is 47" tall. The total vertical length of the head board is 24&1/2". There is a 11" gap from the mattress platform and the bottom of the head board, so it would be a good idea to purchase a mattress which is at least 11" thick or include a thin box spring so a pillow doesn't fall through. "What are the dimensions of the slats area? This seems like a slightly bigger than full bed"
The area is 55”wide x 74 ¾” long. "Does this bed accommodate a boxspring plus the mattress? If assume the boxspring and Mattress are 10" each, how many inches would be left from the top of the mattress to top of head rail? "